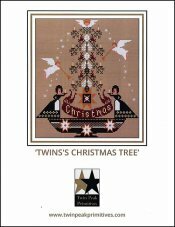 Twins's Christmas Tree [W5889] - $14.00 : Yarn Tree, Your wholesale source for cross stitch supplies. Cross stitch pattern by Twin Peak Primitives. A Christmas tree is decorated with beautiful candles and an angel as the tree topper. Angels are trumpeting along the side of the tree. It's a "Twins's Christmas Tree." Stitch count is 132W x 136H. Stitched on #7548 Zweigart Aida 14 Dirty.